Just one layer of soft knitted cotton, no filling. The interlock knitted cotton is really soft and comfortable to sleep in. 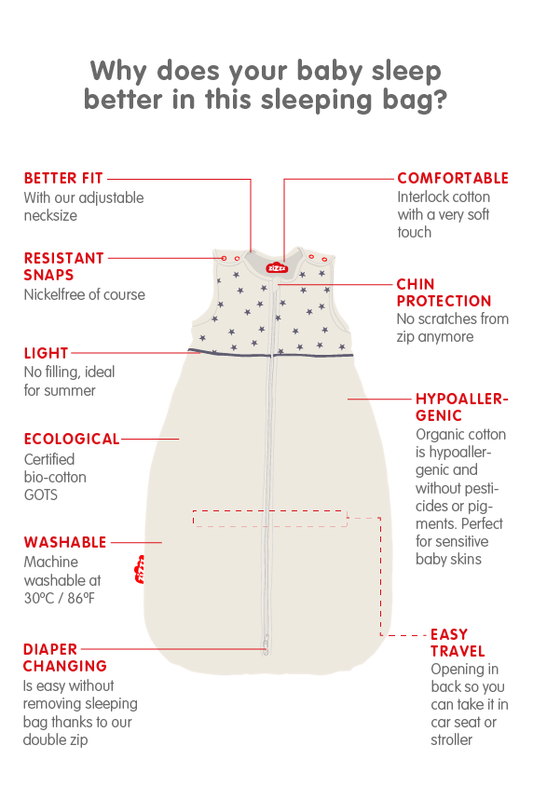 With our practical double zipper, you can change your baby’s nappies without removing the sleeping bag. An opening on the back allows the sleeping bag to be worn in a car seat or buggy, so you can put your baby straight to bed when you arrive home. Made in Europe from 100% natural and ecological materials. Could there be anything better for your baby to sleep with than stars? Motives with stars are soothing and positive. Let your baby go to bed with his/her lucky star. Super produit que je recommande à tous!